If you are well accustomed to the firefighting industry, then the National Fire Protection Association (NFPA) is nothing new. For decades, the NFPA has set guidelines for all aspects of safety regarding the firefighting community. The NFPA standards have become widely adopted around the world and play a large role in the Aircraft Rescue and Firefighting (ARFF) industry. When an airport is getting ready to build a new vehicle, they typically ask the manufacturers who are bidding for their business to follow the NFPA standards in the specification presented to them. No matter what line of fire duty you are in, these standards have impacted you in some way. 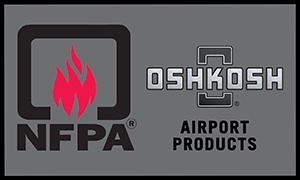 Oshkosh Airport Products is here to explain why these guidelines should matter to you. The NFPA has created a set of over 300 standards that are published in different categorical guidebooks. For example, they have anything ranging from how to set up an airport response plan to personal protection equipment recommendations; the range is so diverse. Each standard or guidebook has its own committee which consists of a diversified group of experts on the topic. These standards and guidebooks are on a set revision cycle so they can be constantly updated to provide the latest guidance to the user community. The committees frequently meet to review the proposed revisions that can be submitted electronically on the NFPA website. The NFPA tries to be all encompassing, and has an open platform for revisions. Take advantage of this! You are the one that is immersed in the firefighter culture and works within it every day. If you think something should be changed, submit a revision. The committee values peoples’ opinions and has a specific process to ensure that every submittal is revised by the committee and discussed. You have the power to help shape the industry and that’s a powerful tool. It’s important to take ownership of your career and help shape it to be safer, more cutting edge, and as flawless as possible. Once a revision is submitted, it is put in que to be reviewed by the committees during the revision cycle. The topic-specific committee sits down and has a discussion about the suggestion for change. Each submittal is reviewed by the committee and the submittal can be taken as-is, revised or rejected. The review process has several stages and allows for multiple comment periods to fully vet each submittal. This is to ensure that the user and the committee members are both heard. The NFPA tries to cultivate a two-way conversation. All of the meetings are open to the public, and people are encouraged to attend. The NFPA wants to strengthen their standards, and needs you to participate! The firefighting industry is in a unique position; most fields do not have an opportunity to impact their line of work for the better like this. In a world where the matter of life or death, it is important you raise awareness about things that you see could be improved and share your knowledge with others. You have the power to make impactful changes; do not hesitate to take advantage of it!